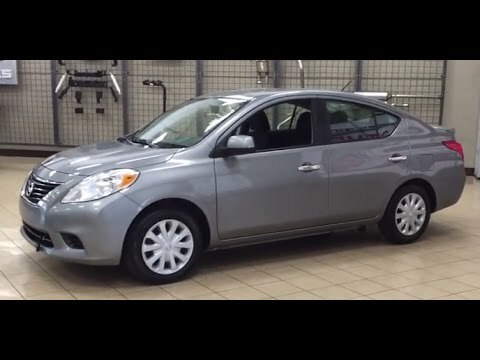 The 2013 Nissan Versa sedan holds the distinction of being the least-expensive new car you can buy. Not surprisingly, this is a no-frills vehicle, but what it lacks in features it makes up for in its high fuel economy, overall low cost to own, and surprisingly roomy accommodations. Great car overall love playing my old high school CDs on it. I love my car it drives so smooth and quiet. It also does really good on gas it gets full with 25 dollars very reliable. All the windows go all the way down I love that. In the motor area its really easy to find where the oil, water, steering wheel liquid, windshield cleaner and lots more. My car is not to low not to high just right. The area on the back is great lots of room for baby car seat or tall people lol. Also I love the trunk because I can fit my groceries and my double stroller. The spare tire is very easy to get to and easy to take out. I love that my gas pump is attached to my car because otherwise I would have lost it long ago. My Nissan also has a latch on the driver side to open the trunk which came in because my key got worn off and didn't want to unlock my trunk anymore. The radio is great really loud and the signal is also very good never had problems. Seats are super comfortable I've actually had to sleep in my car a couple if times slept like a baby. Over all I give the Nissan Versa a great review because it has not failed me or gave me any trouble in the past 3 years that I have owned it. I love the fact it gets great gas mileage, it is dependable and comfortable. My Nissan has comfortable seats, it gets anywhere from 38 to 41 miles to gal. It seats 5 people comfortably. It has skid resistance that easy to change to in icy roads conditions button is so easy to get to with one push of a button on dash. Easy to get around in busy or large towns. Had only one recall which was changing out a belt. We haven't had any major problem with this vehicle change windshield wipers two times. Tires are reasonable low cost. Oil change every 1000 miles. It has cruise control, the button to cruise press on the steering wheel and touch cruise to set, easy. Small enough to get in and out of small areas. When driving I had no problem seeing in every direction including what's coming up behind me. One of the smoothest small car I have ever driven. The paint has not discolored and easy to clean, body and underneath. It is very reliable in rain, snow and hot weather, air conditioning is very cool very seldom do I turn it on high. Easy to clean inside and out. Has comfortable room inside for tall people like me. Very reliable I would buy another one if something happens to this one. Small car but big space! Runs smooth and looks sporty. I absolutely love this car, but had to get it because I totaled my SUV. The car is comfortable and drives great. Only thing that I wish was a little bigger was the center console. There is no really console to store anything and makes the car feel a little empty inside. The backseat is amazing and quite large despite the car being so small. Very spacious seats! Also, after having it for 5 years I had some wear and tear that is uncommon and cost me a little over $1k which was disappointing. Not sure if the west and tear was because of the quality of the car or my driving (which is actually pretty normal). I would recommend this car to anyone and it is a great price. Also, had great safety ratings.